Be it a bubble or a breakthrough, investors are sure loving games. Not two weeks ago, Seattle based Big Fish Games, a maker of downloadable games, drew down an $83m round; a number likely big enough to put them on the podium for the largest gaming venture financing of all time. Today, Redwood City, CA based Trion World Network, a “server based” game developer and publishing platform company, turned in a medal worthy performance of their own. In a series C round, Trion raised $70m. The round was led by Act II Capital and a “large financial institution” whose name the company withheld. Prior round investors including DCM, Trinity, Bertelsmann, Rustic Canyon, Peacock Equity (NBC Universal and GE Finance venture arm) and Time Warner also participated. Trion was founded in 2006 by EA’s former vice president for global online business, Lars Buttler and former New World Computing CEO Jon Van Caneghem. More than just a publisher of Massively Multiplayer Online Games (MMOGs), the company has set its mission at no less than revolutionizing “interactive entertainment by combining the best of online, gaming and traditional media.” They are building customized server infrastructure and developing game titles. In June, the company announced a partnership to co-develop a TV show and online game with NBC Universal’s Sci Fi cable network. The game, as yet untitled, will evolve to match the TV programs content. The company has also acquired rights to develop and publish games on Sony’s PS3 console. (So far, there’s been no announcement of any planned dynamic gaming titles in development). 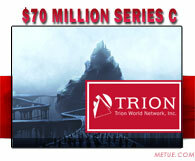 Trion previously closed a $30m Series B round in July 2007. The massive new pool of capital will likely go towards the transition from infrastructure development to commercial roll out. • Live Gamer: $24m to Build Trading Platform for a Virtual World?